Hasbro and Electronic Arts today announced that big things are just around the corner for the millions of Littlest Pet Shop fans this fall. Hasbro will release an expanded Littlest Pet Shop Online (LPSO) toy line-up to retail this month. In addition, EA is set to launch a new virtual pet collection program within LPSO.com. 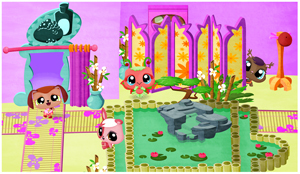 Together, the growing Littlest Pet Shop Online experience will offer a blend of real-world and online play designed to capture the essence of the globally popular tween girl brand — collectability. Building on the success of the Frima Studio developed Littlest Pet Shop Online, an immersive online world launched by EA in September 2009, Hasbro has added two new Littlest Pet Shop Online toys to its fall line-up that will allow girls to extend their real-world Littlest Pet Shop collections while also giving them special LPSO.com virtual benefits when they enter special codes included with toy purchases. Landing on retail shelves this month, the LPSO Dancing Dog and the LPSO Starter Pack toys further integrate the two play styles and enable girls to collect their favourite Littlest Pet Shop pets, connect online with friends, play games, and embark on fun adventures. Additionally, EA’s upcoming LPSO.com collection program, “Collect- a-Pet”, will broaden the online play experience with a series of in-game activities and challenges that girls must complete to unlock new adorable “Reward” pets that can be added to their growing virtual collections. T he LPSO Dancing Dog is an interactive pet that plugs into the computer or an MP3 player and boogies to the music on girls’ digital playlists. It also functions as a speaker and lights up and flashes to the beat creating instant Littlest Pet Shop fun. In addition, the LPSO Dancing Dog comes with a secret code to LPSO.com that unlocks special virtual in-game gifts. The LPSO Dancing Dog will carry an approximate retail price of $24.99. Also on retail shelves this month will be the LPSO Starter Pack, which will allow girls to collect toy versions of their beloved LPSO.com star characters. Girls can assemble up to six of their favorite in-game characters such as Felina Murchent, the fashion-forward kitty who purrs with style and sass and Woolma O’Chic, the charismatic artiste who creates the trendiest designs available in LPSO fashion. Each LPSO Starter Pack pet will also come with a unique LPSO.com code to unlock a 30-day Premium Membership subscription as well as virtual gifts for a girl’s in-game pet. The LPSO Starter Pack will carry an approximate retail price of $9.99 for each of the six characters including a one-month Premium Membership for each pet purchased. Adding to the fun and excitement of Hasbro’s new LPSO toys, EA will roll out major enhancements in LPSO.com this month, including the new “Collect-a-Pet” feature which will allow girls to unlock “Reward Pets” when they complete certain in-game activities such as performing multiplayer pet tricks, starting dance parties, or completing a challenging level in one of the many games. The LPSO.com “Reward Pets” will be a very special stand-out addition to girls’ online pet collections as many are inspired by their adorable on-shelf toy counterparts. The LPSO.com “Collect-a-Pet” feature will debut with four “Reward Pets” that will be accessible to all LPSO.com players like the Spotted Dalmatian, inspired by the Dalmatian that comes with the Littlest Pet Shop Rescue Tails Centre playset, also arriving at retail this fall. Additionally, 15 special edition pets such as a Strawberry Hamster and a Candy Zebra will be available exclusively to Premium Members. Littlest Pet Shop fans can create an LPSO.com account and play for free under Basic Membership or purchase a Premium Membership subscription with exclusive features and benefits for $5.95 per month. This entry was posted on Tuesday, September 14th, 2010 at 11:25 am and is filed under Business News, Casual, Digital Products, Everyone, New Releases, Simulations, Social Media, Upcoming Releases. You can follow any responses to this entry through the RSS 2.0 feed. You can leave a response, or trackback from your own site.